Rough itinerary for my Iceland week, part one. – Let Us Live Like We Mean It! Here’s what I’m planning so far for my week in Iceland this coming summer. 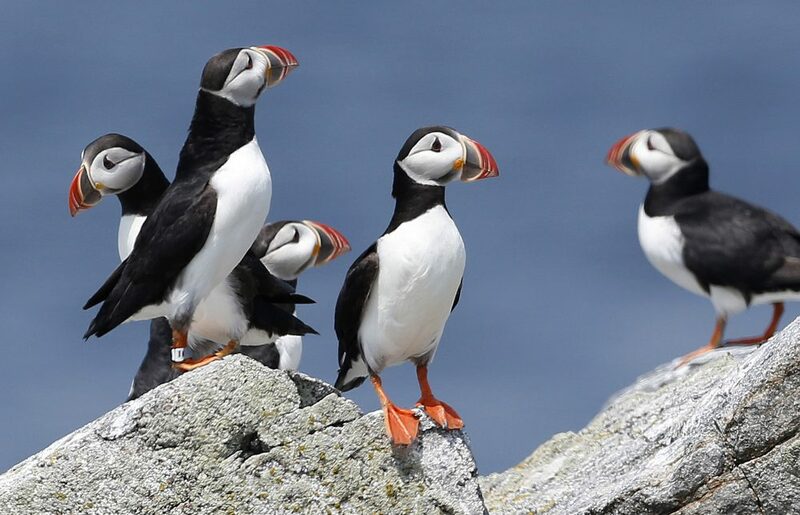 The trip has moved up to June instead of August, because the seabirds I want to see (especially PUFFINS!) will be leaving the island for more southerly parts in August, after spending the breeding season in Iceland since May. The other temptation for a June stay is the annual Viking festival in Hafnarfjordur, aka the Town of the Hidden People. Although I think the Hidden People will make themselves quite scarce indeed during the festival! So: I’ll arrive at Keflavik International at 8:30 AM local time, pick up my rental car (I’m getting a great rate because I’m an AARP member), and head to Hafnarfjordur. There I will either stay in a guesthouse where I’ve reserved a room, or else with my friends Olafur and Bjorg in their new apartment. They won’t know whether their spare room will be available until February. I had hoped to get a bed in the Viking Hotel, but it is already sold out because of the festival. But I might decide to pass up the Viking festival, largely because I don’t much like festival crowds, and I see a lot of Viking reenactment with the SCA (although it would be cool to compare our events in the USA with one done by folks on the actual scene, so to speak). Most of the places I’ll be talking about can be found on this map, except for Hafnarfjordur, which is south of Reykjavik, the capital city, at the bottom of the map. I’ll often refer to the numbers marked on it. The Borgarnes area (number 4 on the map) has lots of things I’d like to check out. The museum and Settlement Center, the graveyard where Egil Skallagrimsson’s dad is buried, and, about twenty miles out of town, Reykholt (5). Reykholt is where Snorri Sturluson, the author of Egils saga, among other works, was ambushed and murdered on the orders of the King of Norway in 1241 during a very turbulent era in Iceland’s history. The second day I’m in Iceland, I’ll head up west to Snaefellsnes (which starts around number 7) and stay two nights at Langey Homestay in Stykkisholmur. You can see pictures of it in my last post, I’m going to Iceland, after all! Here is one of my favorite photos of Snaefellsnes. Sadly, I cannot now find the photo credit. If you know it, please give it in the Comments section, so that I can edit it in with the picture–thanks! I’m going to have to start taking notes while I’m studying guidebooks and the sagas, and then making lists of sights I want to see while I’m up west. For example, in one of my guide books yesterday I read of Stadurstadur (8), a site associated with Ari Thorgilsson, who was called Ari the Learned (1068-1148). He was the author of Íslendingabók (the Book of Icelanders), which is one of the earliest histories of Iceland. It sets forth the principal settlers (called “land-takers”) of the country from 871 to 930 C.E. But I forgot to write down this important sight on a list of the places I want to see. Without such a list, I’ll miss things out of negligence. I’ll still miss some things out of necessity, because there are more things I want to see than I have time or energy for. But I don’t want to overlook something just because I forgot it! When I first get to the peninsula, I plan to drive around the western tip of it, where the volcano and glacier and national park are (9 through 14). Then I’ll arrive at the Homestay in the evening (15). Speaking of evening, there will be nearly 24 hours of light every day and night I’m there! My second day in Stykkisholmur I want to take the Baldur ferry across the huge bay of Breidafjordur to Flatey Island (17) and maybe all the way up to the West Fjords, just so that I can say I’ve been there. 🙂 This boat trip is when I’m hoping to score some sightings and maybe photos of various seabirds, namely PUFFINS! Hehehehe….. Speaking of puffins, we need to see some of those adorable auks. This takes us to the midpoint of my planned trip. I’ll conclude my itinerary in the next post. Previous Previous post: I’m going to Iceland, after all! Timi, I can feel your excitement building. This trip will be good for you. This all sounds so great. I hope you get to go and see everything you want to see and have a wonderful time. Pingback: Part two of my rough itinerary for a week up in West Iceland – Let Us Live Like We Mean It! Pingback: Alternate itineraries for my Iceland week: a poll! – Let Us Live Like We Mean It!